The NJ Chapter of RIMS has announced a $100,000 donation to the Spencer Educational Foundation, allowing creation of the New Jersey RIMS Spencer Scholarship. The first scholarship will be first granted through the Foundation in the spring of 2014. For many years, the Chapter has been raising funds for various scholarship awards. The time was right this year to consolidate our educational outreach, and work with Spencer to create and award an annual scholarship in our name. The chapter will fund this scholarship from past and future fundraising initiatives including proceeds of our highly successful golf outings. Spencer announced the grant at its annual gala on September 17th at the Waldorf Astoria and released the bulletin below. Also attached is a photo of the NJ RIMS Board members who attended the gala and presented the check to the Spencer Board. In the photo are, from left: Peggy Accordino from Spencer; Karyn Connor, Joseph Frank, Kris Wrzos, Danielle Roth, Ike Jenkins, Matylda Spataro and Anita DiGiulio from the NJ RIMS Board; and Zakia Campbell from Spencer. 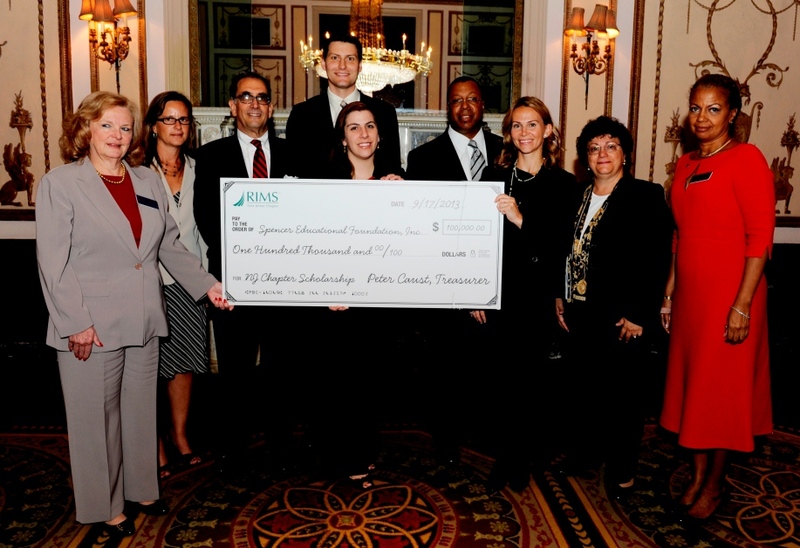 New York (October 2, 2013) — Spencer Educational Foundation, Inc. has received a donation of $100,000 from the New Jersey Chapter of the Risk and Insurance Management Society (RIMS). The funds will go toward the creation of a $5,000 New Jersey Chapter Scholarship that will be presented annually to support graduate and undergraduate students studying risk management and insurance. The first scholarship will be awarded in the spring of 2014. Since 1979, Spencer Educational Foundation has awarded more than $5 million in scholarships and $2.2 million in grants to students pursuing degrees and universities offering programs in risk management and insurance. This year, the Spencer Educational Foundation awarded more than $350,000 in scholarships and more than $300,000 in grants. For more information about the Foundation, or to make a donation, visit www.spencered.org. Spencer Educational Foundation, Inc. stimulates, promotes and encourages promising undergraduate, graduate and doctoral students of risk management disciplines in fulfilling their educational goals by providing scholarship awards and educational grants. Established in 1979 to honor the late Robert S. Spencer, the foundation is administered by its Board of Directors and is affiliated with the Risk and Insurance Management Society, Inc. (RIMS) in New York. For more information, visit www.spencered.org.